Before I discuss today’s photos, I must explain that all of the photos of the morning-prayer session were taken from a boat. We toured up and down the river in an old wooden boat looking at both the architecture and the people. 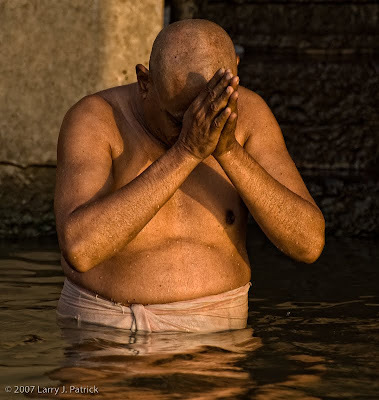 Today’s images are of some Hindu priests. I sat and watched these men for some time before finally taking their photo. In truth, I never really came to a clear idea as to what I wanted to do with the photos. Usually when I do that, I end up with little more than garbage, but for some unknown reason, the photos seemed to work. Go figure! 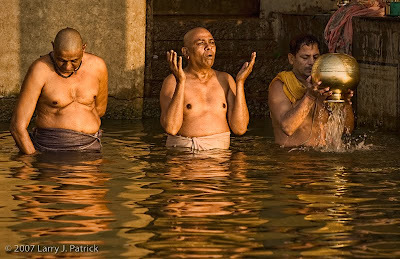 I like how the early morning light gives the priests a warm glow and how the light is reflected off the water. Camera settings: Nikon D200, Nikon 70-300mm f/2.8 at 300mm shot at ISO 100, f/6.7 and 1/90th of a second. Lightroom—Set white and black points, added mid-tone contrast, added clarity and cropped images. Photoshop—used nik Color Efex tonal to add contrast to highlights, mid-tones and shadows of various parts of the image. Super work. You can feel the devotion in these photos. The early morning light as it bathes everything in that warm color really sets the tone for this photo. You've captured the essence of each photo and a moment in time to share with us all. Again, the earth-toned colors and the golden light are just beautiful. The reflections make an interesting foreground element and I like how you have captured the 3 men doing different actions during their devotional. The fabric in the background is a little distracting but could easily be removed in post processing if a cleaner image was wanted. Very nice! It is good that you are in India. You should probably have so much to photograph there. It is one of the most culture rich countries in the world. The golden light makes these men glow and seems so appropriate for the subject matter. Nicely done. I think you captured the mood of the scene in these pix. The warm light adds a lot to the photos. These are my favorites (so far) of the series of candids you are posting this week. My favorite is the close-up of the individual priest which has more emotional impact for me because of the intimacy of the photo.